Bestway Lazy Spa Palm Springs Review – Rated 4.8 Stars! First released in September 2014, the Palm Springs Lay-Z-Spa is one of the largest in its range – and definitely one of our favourites. The tub has a sandy brown PVC exterior that matches with a beautiful white inlay. We haven’t come across many inflatable spas that look quite as attractive as this one. Scroll down for our full product review – including our favourite features, imagery and product specifications. We’ve also compared 12 UK retailers to find you the best possible prices in the whole of the UK and (FREE) 1 year warranty! Review Summary: The Lay-Z-Spa Palm Springs is the best pick for those looking for a tub on the larger side – a size perfect for large families and those hosting social events and parties in their garden. With extra water capacity, high walls and a padded interior; it’s perfect for sitting back and relaxing in the warm bubbles. On the exterior, this circular inflatable has a deep sandy brown colour – we think it’s the best-looking tub of the entire range. At just [amazon template=price&asin=B00N8P5A36] it’s available at a great price too. Your friends and family will LOVE this spa! The Palm Springs spa is probably best known for its huge capacity and stunning appearance. With higher walls than any others in the spa range, this inflatable can hold 963 litres of water – more than any other in the range (aside from the very pricey Monaco range). This product also has large dimensions, with an extra 10cm in width compared with traditional sized tubs. This means extra room that helps to fit more people and increase the amount of personal space for each user. With 120 air jets this extra space doesn’t mean you’ll compromise on massage-quality either, it’s pure bliss! We know that breakage and punctures can be a problem with some inflatable spas, but not this one. The Palm Springs has a sturdy Ibeam construction built into its interior, with the exterior reinforced with 3 layers of PVC to prevent punctures. If you’re worried about longevity and wear-and-tear, this is the product for you. With a huge water capacity and tall inflatable walls, this was already set up as the ultimate spa for comfort. The makers compounded this by introducing an incredibly soft interior and cushioned floor. Lay-Z-Spa have released a newer model since this product was released, though the Palm Springs has also been upgraded during this time. The Saint Tropez has been touted as the new ‘replacement’ for the Palm Springs range, though it doesn’t have the same size dimensions or water capacity. It does have LED lighting (which we love) but this can be bought separately for use with this product. At 1,210kg when filled this hot tub is also seriously heavy, so not suited for those with weight limitations (for instance if you plan on sitting it on a deck). Bear in mind that you’ll need to sit the tub on a hard, flat surface that can resist the pressure of over 1 ton in weight! Another downside is that the larger water capacity does mean increased consumption of electricity (to help keep the water at temperature). This can mean electricity bills of £15-£20 extra per month if you’re a regular user. This has more air jets than any other spa at 120. It really is outstanding for massaging comfort! This product is also one of the most spacious in terms of water capacity, making it an absolute must for those purchasing their tub for garden parties and socials. It has a three-layer outer body with reinforced PVC to help prevent punctures. It’s probably the most attractive tub in the whole Lay-Z range, with a luxurious light brown leather appearance. The inside of the inflatable has a soft leathered material on the inside walls, with the floor cushioned for ultimate comfort. This is definitely heavier than other tubs in the range – especially when filled. Definitely not suited to decking that hasn’t been reinforced. There is no LED lighting with this model like the upgraded Saint Tropez. These lights can be bought separately from Lay-Z and other retailers on Amazon. Greater water capacity means slightly higher electricity bills for those who use their spa frequently. This tub is bigger than most others – perfect for large families and social use. At 963L you’ll never be short of space to lounge in comfort. And it certainly won’t take much to keep yourself submerged with so much water capacity available! The white inlay matches beautifully with the light brown outer PVC. The lid clips on easily with double-lock safety clips. The outer material is also highly durable and resistant to puncture from sharp objects. With a max temperature slightly higher than most tubs and 120 air jets blasting bubbles simultaneously, this is absolute heaven on Earth! You’ll wonder how you ever lived without it. The spa comes with two filter cartridges and the housing unit as standard. This makes water filtration a breeze, allowing you to concentrate on enjoying yourself. While you will need to make sure you replace the filters regularly, you won’t find many tubs with filter systems as efficient as this one. 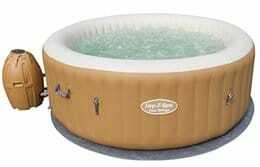 When bought from Amazon the spa comes with a one year warranty which can be extended if needed. Lazy Spa also have a GB-based support team that can help with any queries should you run into issues during installation or after you’ve began regular use. There really is minimal effort needed when setting up the Lay Z Palm Springs model. In fact despite it’s size, this tub is just as easy to set up as any of the others in its range. It’s as simple as unboxing everything when it arrives, getting the pieces in place – before using the pump included in the set to blow up the outer frame. This whole process takes no more than 15 minutes before you’re able to start filling with water. From this point the spa can be left for 24 hours to heat up, after which time it should be ready to use. Remember that you’ll need to add the chlorinated crystals to the water and test the levels using test strips for its chemical levels before getting in. These can be found in the Clear Water Chemical Kits that can be found on Amazon.